Maybe you’ve seen this pie chart divided into three sections. The tiniest section is what we know we know. I know how to walk and talk. I can (mostly) care for myself and relate effectively to others. Because of my education, I know a fair amount about history, psychology, math, and science. I can program and troubleshoot computers with some level of proficiency (or at least I used to). 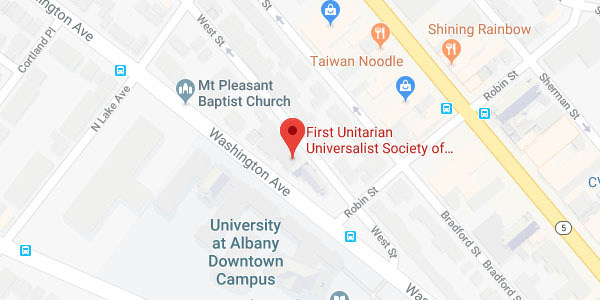 I know a lot about Unitarian Universalism and how to be a minister. The next bigger wedge is labeled what we know we don’t know. I am only fluent in English so there are many languages I know I can’t speak or understand. There is a whole lot of math, physics and chemistry that I don’t know or have forgotten. There is an enormous amount music I’ve never heard and numerous books on my kindle I haven’t read or only read the sample content I downloaded. I’m aware of the vastness of what I don’t know that I would like to know – if only we could design a brain-machine interface so I could just download it all into my brain like what happens in science fiction. The biggest of the rest of the pie is all that I don’t know that I don’t know. I can’t even describe what that might be because I don’t know what it is. When I was in elementary school I didn’t know calculus and differential equations were a thing. Neither had I any idea about quantum mechanics or quarks. Think about what people didn’t know they didn’t know two or three hundred years ago! Even more troubling is what people two or three hundred years from now will know – and will be looking back on us as primitive ignorant fools. And even then there are limits to what it is possible for us to know. I think about that as I sit out on a clear, crisp summer night in some very dark place and look up at the stars. Most of what I see is very, very far away, a distance measured in light years. There are spectacular events happening out there thousands of light years away that will not be known by our astronomers’ tenth or twentieth generation of grandchildren. It will take that long for the first light to reach us that will let us know something happened. We could be the vanguard of life in the universe. Or life could be evolving in hundreds if not thousands of places just in our galaxy. There may be perfected life forms out there who have answered all of life’s most persistent questions. And they can’t tell us about it because they are just too far away. Or maybe their spacecraft are on their way now. On the other hand, there could be predatory life forms out there just waiting for the first radio transmissions from us. Once they figure out how to decode our television signals, they will see how tasty we are, then decide to come find our planet by following those signals as a homing beacon … and eat us. There are vitally important questions that perplex us like the meaning of life, the existence or non-existence of a supreme deity, whether there is life after death or some kind of continuity of existence between reincarnated bodies. But we may be asking the wrong questions or framing those questions in ways that isn’t helpful, useful or satisfying because we don’t know what we don’t know. Even asking these important questions at all might be part of the problem. Embedded in them is fear that we are either missing out on something important we should be doing or we are doing something that we should NOT be doing. There is no rest for the weary Christian striving to build heaven on earth following the guidance of Jesus. Jews are commanded to follow the law and repair the world. Muslims strive to surrender their will to Allah. Buddhists seek to awaken, be liberated from suffering and then save all beings. 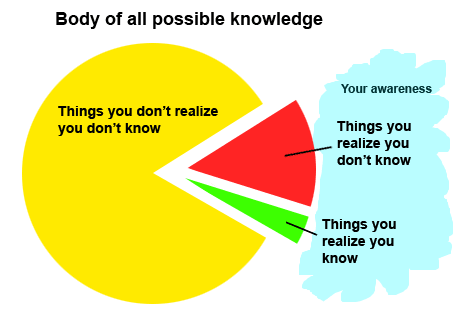 And still, we will not know what we don’t know. There is no escape from not knowing. And some of what we don’t know could help, harm or both. There is just no way to remove deep mystery from every day of our lives. That mystery is so large is engulfs everything we know and know we don’t know. So how do we live without knowing, recognizing that what we don’t know is as likely to harm us as help us? One look at a black hole tells us the universe is anything but benign. The best answer I’ve got is letting go of knowing-it-all as a life goal. That doesn’t mean letting go of advancing my knowing and expanding that first sliver. There are clear benefits to knowing more – a reason our brains are so big. Life values the expansion of knowing for improving the odds of survival of any life form. Just recognizing that you don’t know what you don’t know creates a little humility and openness to others, and a willingness to learn. That too has evolved a powerful tool in us called curiosity and interest that helps advance our knowing. That has been a successful survival strategy too. So as we consider the theme of “mystery” this month, I recommend not fighting with it or resisting it. Just let the mystery be and dance with it. You just might learn something!